T he Redmond School of Glass is offering admission to two students in their ornament/ float class. 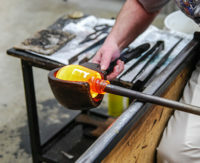 Learn the basic aspects of creating blown glass objects: add your color, heat your glass, shape it, and remove from the pipe. You will get to be hands on all the way.